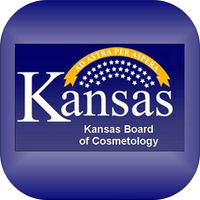 The mission of the Kansas Board of Cosmetology is to protect the health and safety of the consuming public by licensing qualified individuals and enforcing standards of practice. NOTICE: A bill has been introduced in the House that impacts the Cosmetology Professions. HB2200 Exempting hair threading from the practice of cosmetology. The Board is in opposition to the Bill and plans to provide testimony as needed. Please visit our Facebook page to take a poll to let us know what you think. KBOC cares what you think! Please email us with your comments and suggestions. If you are unable to read any of the information contained on this website, please contact the Kansas Board of Cosmetology. We will be happy to assist you.